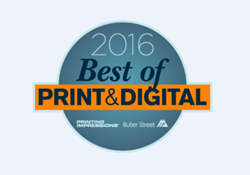 SupplyLogic, a leading Marketing Procurement partner for print, promotions and digital, has been named a winner of the industry’s 2016 Best of Print & Digital™ award program. The first annual program identified which companies provide the highest service delivery to their customers through Butler Street Research’s independent survey of the print and digital industry. Only the very top companies in the industry were able to achieve this distinct honor, and SupplyLogic is honored to receive this award. The rapidly growing private US company recently signed multi-year service contracts with National Vision Inc. and Asurion. It works closely with leading Private Equity firms to greatly improve the efficiency, agility and brand consistency of national brands, with a specialty in the Retail, Consumer Packaged Goods, Financial Services and Heath Insurance sectors. Unlike many others, the company typically places subject matter experts on-site at its clients’ headquarters, supporting them from its analytics operations in Chicago. Butler Street, a leading provider of client loyalty research and retention programs across the print industry, in conjunction with NAPCO Media, Printing Impressions and Print+Promo, launched the Best of Print & Digital Program™ to recognize those companies with the highest customer loyalty in the industry. Butler Street specializes in helping companies and their people grow and delivers lasting results in the two most challenging areas that companies face: client development and talent development. For more information: http://www.bestofprintanddigital.com. A video of SupplyLogic President and COO Frank J. Olivieri discussing the program behind the company’s use of loyalty metrics can be viewed at this address: http://bit.ly/20X7Gjc.